We have set up this site to share our retirement life with our family and friends and to provide a way for our kids to keep track of our activities. We are located on Florida's Sun Coast 45 minutes south of Sarasota. Gold Medals at the 2016 Florida State Games, Coral Springs, Fla.
August 2018 and we know each of us has earned another year (82 and 83), this week another anniversary (34 years), and another year in Florida (22). Time's a passing! For our birthdays this year we ordered a custom made genoa sail for our Com-Pac 16 pocket cruiser, Encore. This will stay on the boat as Jack has made a furler. It looks beautiful, but has not yet been tested by a sail. We currently have hot, thunderstorm days and extremely bad red tide. Fortunately, there is no smell at our home, nor any evidence of fish kill. We continue to get more involved in church activities at Englewood United Methodist Church. Jack is able to use his skills in the kitchen for weekly dinners and Pancake Breakfast sessions. He also is very involved in weekly preparatory work for the February annual rummage sale which raises over $72,000 for missions and good works. We have really found a home at this church. We are thankful to be in relatively good health and able to be in this lovely home next to the water, birds, and xeriscaped yard showing lovely butterflies, that doesn't need to be mowed every five days. The tending and pruning can be done at leisure. We also have several garden boxes in our back yard. The produce not only provides nourishment, but lovely ambiance. June 23, 2018 brought the beautiful destination wedding of our granddaughter, Sarah Tanner to Sam Coba. It was a beautiful event in Asheville, North Carolina. Besides their day jobs, they have a photography business. Their photos are some of the most artistic and beautiful I have ever seen. September 2017 was quite the eventful month! We had an adventure to remember. Hurricane Irma necessitated much preparation and actions. We are only 8 feet above sea level. Jack, singlehandedly, installed all shutters, trimmed trees, etc. We loaded the van with two weeks of goods, important files and papers, and all the things advised for shelter living and literally said goodbye to the house. Daughter, Kelly, here in Englewood, is a nurse for the State of Florida. We were able to accompany her to her assigned special needs evacuation center, Lamarque Elementary School in North Port. After a day and a half, we came home to find no damage to our place or boat. We had a rough couple of weeks with no power or A/C and had a taste of old Florida living. Jack's thoughtful preparations allowed us to do OK.
2017, had also brought some lifestyle changes. The Ice skates were put in warm/cold storage. We miss the camaraderie of being with skating friends, and flowing to music on the ice. We don't miss the expenses of ice time and gas to get there. We love not having to fight traffic on I-75 with its congestion, construction, accidents, and distracted and aggressive drivers. With Bev's diagnosis of Atrial Fibrillation and being on the anticoagulant Coumadin (Jantoven) skating was more dangerous! The time was right to say goodbye to that wonderful sport we enjoyed for over 30 years. Our bodies miss the workouts, but Jack always has his workouts in his lifestyle. Bev does a full body exercise program every other day on our Pilates Reformer and rides the exercise bike now and then. In May of 2016, we challenged ourselves for our last competition when the Florida Sunshine State Games offered adult ice dance events. We skated the Canasta Tango and the Swing Dance to fulfill Jack's 80th birthday year bucket list. The event was held in Coral Springs, Florida (next to Fort Lauderdale) and an easy venue for us to attend. We did come home with the gold and real good memories, as we met some old friends and a few new. We especially enjoyed meeting John Kerr, UK Olympic Ice Dancer. September 25, 2015, we skated in what we had thought was our final competition. The Southwest Florida FS Club's USFS Fall Classic was the perfect place to complete Bev's 80th year bucket list item. The judges awarded us gold for our performances of the Dutch Waltz and Cha Cha (two of our favorites). It has been a wonderful 18 year journey of competitions. We had a wonderful long weekend in May 2015 visiting Rob's family in Plainville, Conn. He toured us through loads of Bev's favorite old haunts throughout Conn. for nostalgia value. We went to northwest Conn. to the White Flower Farm, Bantam Lake, where she spent all summers until she was married, and Mt. Tom State Park. We spent one whole day in Springfield, Mass. for Matt's graduation from Westfield State with majors in Criminal Justice and Sociology. We also visited Manchester, Conn. where her kids grew up, and continued up to Storrs to see how much the UConn Campus has grown. We got to watch Lauren play two games of basketball. This was a special thrill as she had major ACL surgery on her knee this year. She wears a long brace, buts moves so well. Sarah has just left her job with Ernest and Young to accept a wonderful position with United Technologies. It will be wonderful not having to work the crazy long hours she has for the last three years. 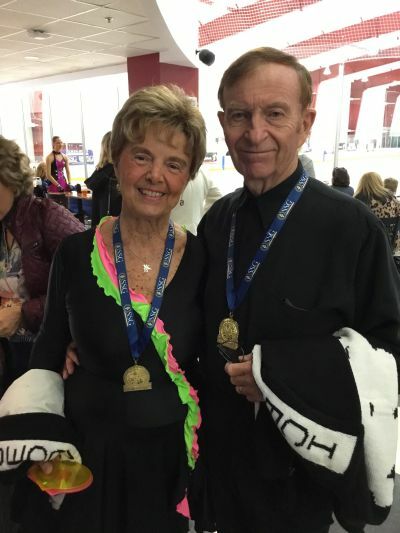 We participated in the US Figure Skating Adult Championships in Hyannis, MA in April, 2014, and came home with a shiny Silver Medal for our four PreBronze Dances. We were very pleased with our performances and lost first place to a wonderful dance team from Colorado Springs. That year the required dances were our favorites...Dutch Waltz, Cha Cha, Rhythm Blues, and the Swing Dance. This was one of our best and most enjoyed competitions. Being on Cape Cod also allowed us to visit our honeymoon area of Falmouth and celebrate our 30th year of marriage. In April 2011 in Salt Lake City, we made our debut at a US Figure Skating competition, the Adult Championships, entering the Pre Bronze Dance event. Click here for the article that honored us in Skating Magazine for being the oldest competitors at the competition. The above trip to Salt Lake City was also part of Jack's celebration of his 75 birthday. To continue that celebration, we drove from SLC to Aspen to visit his son, Darin, and see some of the glorious houses he has built including his own atop an 8000 ft, mountain overlooking Reudi Reservoir in Basalt, Colorado. Then, we flew to San Francisco to visit with his daughter, Danelle, granddaughter, Dana (turning 10) and Anthony. Danelle is so passionate about her city and loves to show it off. We had planned to see Bev's son, Larry and family in San Diego, but that had to be cancelled. Bev's 75th in June 2010 was celebrated in the "highest" fashion as she chose to tandem skydive from 13,000 ft (over 2 miles) in early July. The free fall of 8,000 ft. at 120 mph was literally breathtaking. This had been a long time dream that she worked up to during other birthday landmarks by bungee jumping from a hot air balloon, hang gliding, paragliding, and a flight in a glider plane. We have sold our Sea Wind 24 sailing catamaran, Adrenalin, to an energetic young man with two teenage sons. They sailed it to their mooring in West Palm Beach via Fort Meyers and the Okeechobee Waterway on the kid's spring break from school. The boat performed as advertised and they had a great time. We had been considering getting a pocket cruiser for some time and now are proud owners of a 1981 Com-Pac 16. Jack made a one day round trip to Key Largo to check it out. He loved it and got a deal he couldn't refuse so he bought it on the spot and trailered it home the same day. Left home at 8:30 AM and got home at 1:30 AM the next morning. A long day but it was worth it and he enjoys driving, especially when pulling a trailer with a marginal wheel bearing at night across Alligator Alley. Anyway he cleaned it up, installed davit lifting points and had it ready for his son, Darin, to help him launch it while he was here from Aspen over Mother's Day. He lifts the boat onto our dock with the davits and enjoys working on it at his leisure. It is very easy to launch and to motor or sail in our channel basins or out in Leman Bay. He can take the ICW to the Gulf but that is a longer trip on a boat of this size. After Adrenalin and considering our life phase we thought about naming it Finale but we ended up naming it more appropriately Encore. After 18 years he has officially retired from the Coast Guard Auxiliary (with full pay!). He continues to monitor one monofilament line recycle bin at a local boat ramp for the Auxiliary but no more formal duties and training courses. Jack is still active with the 538 home residential association in which we live. He does their publications, helps out on the neighborhood Security Patrol, provides database support for the Board, and he created and maintains their web site: http://OverbrookGardens.com/ . This year he was again responsible for compiling the 68 page Association directory. He had been the point man to Sarasota County for the 49 properties that are located on our 2400 ft. long channel to get it dredged. This had proven to be very time consuming and frustrating but it is now completed. He also coordinated the dredging of eighteen personal docks on our channel under one County permit. Jack continued sharpening ice skates until the grinder motor burned out on May 27,2017 after sharpening six pair of skates. The cost of repairs would be prohibitive so after 18 years he has retired his Wissota Skate Sharpener. The skaters still dependent on his work were disappointed, but hopefully they can find a good alternative. He is in the process of selling the parts and accessories still in good shape and is enjoying the additional free time and release from responsibility. There is no wrath like a skater who has just had his/her skates improperly sharpened! Since we joined the Englewood United Methodist Church we have become quiet active in renewing our faith and serving in our church where we can. Jack has worked with the annual rummage sale program for the last two years (they took in $62,000 last year) and is now a co-chair that oversees the transfer of donations to storage facilities throughout the year. He works for a couple of hours every Friday morning with a few other guys and sometimes more when donations are heavy. He also runs the dishwashing crew at the weekly church dinners on Wednesday evenings and the Pancake Breakfasts. And what does Bev do????? As Jack's secretary, she tries to keep his crammed calendar and family finances in order. She tries to keep up with the medical info to make the right decisions to maintain our good health. As loving wife, she keeps his home and clothes clean, his tummy fed, and a smile on his face! Enough said! Contact us at: skating.rienks@verizon.net . This site was last updated on 11/03/18.